Have you signed our guestbook? Take a look at what others are saying about us. New shop sign finally arrives and our new centre is more easily recognisable. Proved by the fact that upto now we have had over one thousand visitors, and we hope to have many thousands more. 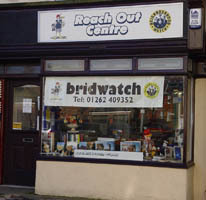 The new Bridwatch newsletter is available to Download right now. Packed full of useful articles.